ALTHOUGH the Tiger was big and strong and fierce, he was so clumsy in his movements that he became the laughing-stock of the jungle. "Look at the clumsy Tiger," the animals jeered: "he will soon starve to death as he is so clumsy that he cannot catch any prey. The Tiger felt very unhappy until he remembered his cousin, the Cat. So, he went to his cousin and said, "Cousin, please teach me all your methods of hunting and catching prey, and I will serve you faithfully for three full years." The Cat agreed. So, the Tiger became the pupil of the Cat, and although they were cousins ​​and he the elder, he showed the Cat every respect due from a pupil to his teacher. He swept the house; he prepared the meals; he ran errands; he accompanied the Cat wherever he went; and he learnt his lessons. In short, the Tiger was the perfect pupil. The Cat at first was a good teacher but later he became jealous of his own pupil. "The Tiger masters all the tricks I teach him, he reflected, and if I teach all I know, he will rival me, nay, he will surpass me, for he is stronger and bigger than me So he decided that he would not teach the Tiger one special trick. "Everything," replied the Cat untruthfully. 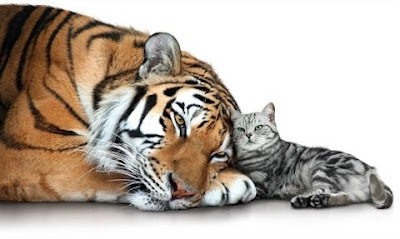 The Tiger thanked the Cat and went away joyfully. The Tiger now started hunting on his own, but he was soon disappointed with himself, for as he crouched to spring on a doe, the latter seemed to know that she was in danger, and ran away. He again crouched to spring on a bullock, and again the Tiger failed to get his prey. "Hide yourself well and surprise your prey 'was one of the maxims of his teacher the Cat, and he had hidden himself well behind a bamboo thicket, but both the doe and the bullock knew that he was there. He was puzzled and, crouching as if to spring, he considered his position carefully. At last he realized that the 'thud, thud' of his tail, as he swished it up and down, served as a warning to his would-be victims. "It is that treacherous Cat, "he cried out in anger, the never taught me to swish tail about the without making a noise. His anger increased when he remembered how silent was the Cat's tail when on a hunt, and he swore that he would eat up the Cat, nay even the Cat's dung, if the Cat could not be found. And from that day onwards, the Tiger has been looking for the Cat, who, however, is so cunning that he is still alive. In fact, the Cat will not give to his old pupil even the doubtful satisfaction of finding his dung, and so he always covers up his dung with earth or ash.